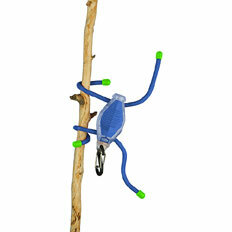 TDmonthly® - New Toys and Games: BugLit™ from NITE IZE INC.
Other products from NITE IZE INC. The BugLit "body" is actually our powerful INOVA Microlight - a tough micro flashlight encased in a durable polycarbonate plastic housing, with four functions (high power, low power, strobe, and signal). This bright white LED has an effective range of up to 50 feet, and one-mile visibility. Next, the securely attached "legs" are two flexible, fully moldable 6" Nite Ize Gear Ties, which can be bent, wrapped, or twisted in many configurations, to sit, stand, store, or shine the flashlight. Wrap the legs around the body for compact storage and transport. And, finally, its lightweight plastic S-Biner clip allows you to attach, hang, or store the BugLit for convenient access on zippers or keys.